Vacuum forming is a leading technology used to process and form plastic plate and cover products. It is used in products ranging from egg cartons and convenience store lunch containers to large articles such as automobile front bumpers. Many of the products we use in our daily lives are made using vacuum forming. Have a look around to see what products are made using vacuum forming technology. You'll find that there are more than you might have imagined. This shows how socially significant vacuum forming technology has become. The term “vacuum forming” isn't one that people come across day to day. However, when you realize how much this technology supports our lives, you will come to see how much it is needed. Society is becoming richer through the technologies of craftsmen and the unflagging planning and development efforts of companies. We always keep customers first and foremost in mind as we strive to produce even better vacuum forming technologies. We will continue to dedicate ourselves, so that we can create the little changes that have major impacts. 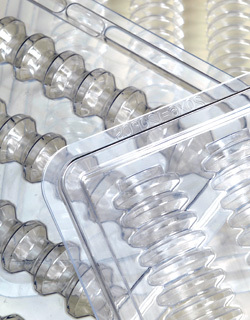 Iwaki uses vacuum forming technology to manufacture vacuum formed trays. 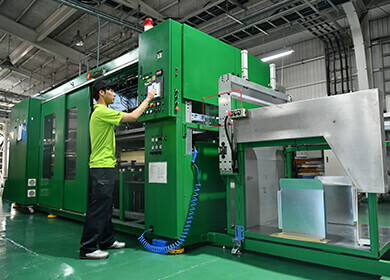 Compared to injection molding, vacuum forming offers many benefits, such as reduced mold costs, the ease with which vacuum-formed prototypes can be created, the ability to supply products regardless of lot size, and the ability to propose impact-absorbent trays made with foam sheets.Iwaki can manufacture trays using various materials, with thicknesses ranging from as little as 0.3mm to as thick as 5.0mm, and with uneven surfaces. We can also meet customer requests for large trays, compact trays, clear trays, or trays in colors such as green or black. 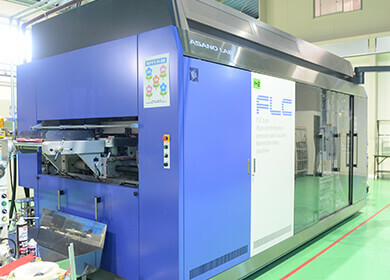 Our vacuum formed tray production equipment includes molding machines which use sheets for one-shot molding and manufacturing equipment and presses capable of continuous, high pressure operation. Our quality also conforms to ISO standards, so customers can use our products with peace of mind. Feel free to contact us with inquiries by telephone, fax, or via our website. We're waiting to hear from you. Iwaki uses vacuum forming technology to manufacture packaging containers and trays for use in every application, including optics, electronic components, precision devices, syringes, vehicle components, and food products. The growing range of applications in which these products are used is making Iwaki products even more visible to customers. Through this, we can discover shortcomings in our current products and make further improvements. We will explore potential new applications for our products which had never before been considered. At Iwaki, we engage in close-knit discussion with customers at meetings in order to accurately assess their needs. Our tray design and manufacturing is based on a thorough understanding of their particular characteristics and properties. We provide a range of products, such as trays available in a wide range of colors or trays for large glass substrates, that meet the wishes of diverse customers. We also use vacuum forming to manufacture products with foamed polyethylene sheets that produce little dust, grip sheets that prevent contents from sliding, and organic conductive sheets, as well as trays for holding seedlings. Covering a wide range of applications is not enough; our products need to match our customers' needs. This is why we at Iwaki gain a thorough understanding of our customers' needs as we manufacture products. If you have any feedback, please share it with us. We would love to reflect it in our future product development. 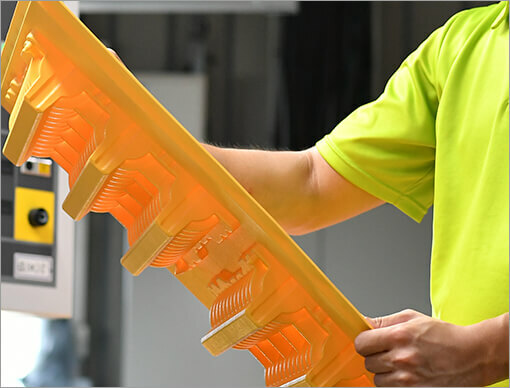 Iwaki's trays, appropriately designed based on our advanced capabilities and extensive experience, prevent problems when storing or transporting products. Our tray design proposals take into consideration the shapes and weights of the products that will be placed on them, the right materials to use, and cost performance. In order to prevent electrostatic destruction of electronic components, we meet our customers' needs by providing conductive materials and antistatic finish materials that prevent the generation of static electricity. Conductive trays are often made by using carbon in the tray material, but this makes it impossible to see their contents. Some of Iwaki's trays are made using translucent conductive sheets. These products were developed in response to customer requests for products that prevent static electricity while still allowing their contents to be confirmed. This is one example of how customer requests evolve into Iwaki products. We will continue to strive to provide our customers with satisfaction. Please try Iwaki's vacuum formed trays. Vacuum forming is a leading technology used to process and form plastic plate and cover products. Plastic sheets which have been softened by heating are placed in a mold, and the air between the sheet and the mold is sucked out, creating a vacuum that causes the plastic to be suctioned onto the mold, shaping the plastic. The product then undergoes finishing, such as trimming off excess plastic, to produce the final product. Everyday products made with vacuum forming include egg cartons, convenience store lunch containers, and automobile instrument panels. Iwaki uses vacuum forming technology to manufacture packaging containers and trays for use in every application, including optics, electronic components, precision devices, syringes, vehicle components, and food products. We meet our customers wishes for diverse applications, including packaging, transport, delivery, and storage. Vacuum forming, which suctions heated plastic sheets onto molds by creating a vacuum between the plastic sheet and the mold, only requires the fabrication of either a mold cavity or a mold core. The pressure used in formation is low, just the single atmosphere of pressure that surrounds us every day, so the molds do not require a complex structure or a high level of strength. Fabricating a mold for use in vacuum forming is inexpensive, making it possible to cost-effectively manufacture packing materials and trays. Lowering costs is important both for Iwaki and our customers. Lower product costs affect overall business costs. This contributes to the development of better products, and contributes to society as a whole. At Iwaki, we start close to home to contribute in any way we can. Not each and every one of the products we make will play a major role on its own. However, we will continue to dedicate ourselves to working from small steps up to major results. Vacuum forming applies little pressure to the mold, so a single mold can be used for a long period of time. We can flexibly meet customer requests for everything from the production of a few prototypes to mass production of thousands or tens of thousands of products. Contact us whatever your needs, whether they be small lot production or mass production. Vacuum forming, which suctions plastic sheets onto molds, can be used to create products of any size smaller than the initial sheet. This makes it possible to create not only small products, but even relatively large products. Flexibly handling orders of various sizes of products, both large and small, enables us to provide customers with even greater satisfaction. Sometimes even small differences can produce great changes for customers. We are sincerely devoted in our efforts to accommodate requests like these. Please contact us with your needs and ideas. Vacuum forming does not require complex molds; it only requires the fabrication of either a mold cavity or a mold core. This makes it possible to rapidly fabricate molds. Furthermore, we handle the entire mold fabrication process in-house, from planning and design to fabrication and forming. This enables turnaround times of as little as three days. We can also create prototypes and perform customization to meet customer desires. We rapidly deliver products that are optimally matched to customer needs. Vacuum forming is a leading technology used by Iwaki to process and form plastic plate and cover products. Plastic sheets which have been softened by heating are placed in a mold, and the air between the sheet and the mold is sucked out, creating a vacuum that causes the plastic to be suctioned onto the mold, shaping the plastic. The product then undergoes finishing, such as trimming off excess plastic, to produce the final product. Iwaki uses vacuum forming technology to manufacture packaging containers and trays for use in every application, including optics, electronic components, precision devices, syringes and vehicle components. We meet our customers wishes for diverse applications, including packaging, transport, delivery, storage. When Iwaki was founded, in 1969, glass spherical lenses created by grinding and polishing were mainstream, and digital cameras had yet to become widespread. Our customers that manufactured optical lenses would wrap them in paper for shipping. This left paper dust on the lens, causing optical lens defects by tarnishing the lens, as well as leaving the lenses susceptible to scratching and requiring a great deal of labor in the lens wrapping process. Iwaki proposed lens pack trays that helped prevent scratches, could easily count the number of lenses, and would make the lenses easier to transport. They were met with effusive praise by our optical lens manufacturing customers. Since then we have continued to propose various vacuum formed trays that meet the needs of our customers. Iwaki proposes vacuum formed tray made with materials appropriate for customers' products. For example, these include oil-resistant materials, shock-absorbent materials, and materials which prevent static electricity buildup. Iwaki offers a diverse range of vacuum forming materials, primarily A-PET (amorphous polyethylene terephthalate), PP (polypropylene), and PS (polyethylene) sheets. We propose and use the materials best suited for customer products. We also offer materials such as PMMA (polymethyl methacrylate resin, acrylic) sheets, Hi-PE (impact-resistant polyethylene) sheets, AES (acrylonitrile ethylene-propylene-diene styrene) sheets, PQ-ACE (low foam polyethylene sheet and high-foam polyethylene sheet composite) sheets, PPF (polypropylene with filler), PVC (polyvinyl chloride), and PSHI (high-impact polystyrene). We offer customers three grades of material, based on their properties. Our inexpensive normal grade materials do not include static countermeasures, our middle grade of materials include those into which surfactants have been blended or applied, and antistatic materials with surface resistance values of 1012 or below, and our highest grade of materials are our conductive grade materials. These have carbon or organic conductive film printed on their surface or blended into them as static countermeasures. Materials of this grade are semi-permanent and have surface resistance values of between 104 to 108. Iwaki uses the latest equipment to reduce the cost of vacuum formed trays while improving manufacturing precision. We use the expertise we have accrued through the years to rapidly perform every production process. This improves production efficiency and enables us to provide high quality, high-value-added trays. We gain a thorough understanding of the characteristics needed by our customers, and our experienced sales staff meets with customers to be able to provide customers with even better vacuum formed trays. Iwaki's sales staff can go on-site anywhere, from Hokkaido to Okinawa, so please feel free to contact us. 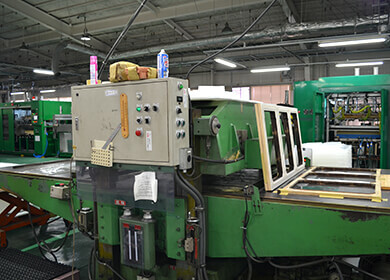 Iwaki's vacuum forming machines are manufacturing devices used to process and form plastic plate and cover products. Plastic sheets which have been softened by heating are placed in a mold, and the air between the sheet and the mold is sucked out, creating a vacuum that causes the plastic to be suctioned onto the mold, shaping the plastic. The product then undergoes finishing, such as trimming off excess plastic, to produce the final product. Iwaki has an extensive track record of accurately assessing customer needs and using vacuum forming machines to manufacture high-quality, high-value-added trays. We use our experience and expertise to handle everything from the planning and design to the mold manufacturing and fabrication with vacuum forming machines for use in a wide range of applications, including optics, ielectronic components, precision devices, syringes, and vehicle components. Iwaki proposes vacuum formed tray made with materials appropriate for customers' products. For example, these include oil-resistant materials, shock-absorbent materials, and materials which prevent static electricity buildup. Iwaki offers a diverse range of vacuum forming materials, primarily A-PET (amorphous polyethylene terephthalate), PP (polypropylene), and PS (polyethylene) sheets. We propose and use the materials best suited for customer products. We also offer materials such as PMMA (polymethyl methacrylate resin, acrylic) sheets, Hi-PE (impact-resistant polyethylene) sheets, AES (acrylonitrile ethylene-propylene-diene styrene) sheets, PQ-ACE (low-foam polyethylene sheet and high-foam polyethylene sheet composite) sheets, PPF (polypropylene with filler), PVC (polyvinyl chloride), and PSHI (high-impact polystyrene). Various other materials are also available, so please feel free to inquire. We offer customers three grades of material, based on their properties. Our inexpensive normal grade materials do not include static countermeasures, our middle grade of materials include those into which surfactants have been blended or applied, and antistatic materials with surface resistance values of 1012 or below, and our highest grade of materials are our conductive grade materials. These have carbon or organic conductive film printed on their surface or blended into them as static countermeasures. Materials of this grade are semi-permanent and have surface resistance values of between 104 to 108. Vacuum forming, which suctions heated plastic sheets onto molds by creating a vacuum between the plastic and the mold, only requires the fabrication of either a mold cavity or a mold core. The pressure used in formation is low, just the single atmosphere of pressure that surrounds us every day, so the molds do not require a complex structure or a high level of strength. Unlike injection molding, fabricating a mold for use in vacuum forming is inexpensive, making it possible to cost-effectively manufacture packing materials and trays. Vacuum forming applies little pressure to the mold, so a single mold can be used for a long period of time. We can flexibly meet customer requests for everything from the production of a few prototypes to mass-production of thousands or tens of thousands of products. Vacuum forming, which suctions plastic sheets onto molds, can be used to create products of any size smaller than the initial sheet. This makes it possible to create not only small products, but even relatively large products. We can flexibly handle orders of various sizes of products, so please let us know your needs.